from performing espionage to gathering intelligence to displaying outright martial might. However, these militia rules are not meant to simulate mass combat. For games in which players wish to act as leaders of kingdoms and armies, see the mass combat rules in Pathfinder RPG Ultimate Campaign. In Ironfang Invasion the Militia represents the organized resistance against the Ironfang Legion. They are the last, best hope for Nirmathas in the face of such an organized and overwhelming force. The rules presented here will allow players to feel as though they are in control of a vast network of talented individuals, while at the same time simplifying play. Throughout the Adventure Path, the PCs are likely to befriend several NPCs who might serve as officers in their militia (see the Officers section below). PCs are encouraged to assign trusted NPCs as proxy officers, given that the nature of some parts of the adventure path may make it difficult for the PCs to execute those roles themselves. Essentially, the PCs must attempt upkeep checks for the week and then decide how to allocate the militia’s available actions, but this is all assumed to happen during the characters’ free time and can occur without direct PC interaction. Now and then, the GM might require the PCs to interact directly with their militia, but for the most part, the group’s development happens on a weekly basis. Rank: The militia starts at rank 1 and can progress all the way to rank 20. A militia’s rank affects many of its properties, including the number of special teams the PCs can keep trained at any one time and the number of actions it can take during the Activity phase. The militia’s rank can even confer special gifts and boons to the PCs (see the PC Boons section below). A militia’s rank increases as its training score increases. The second column of Table 6–1 shows the minimum training score (see Training below) required to qualify for each rank. A militia’s rank never decreases; if the militia’s training score falls below the minimum amount needed to achieve a rank, the militia takes no penalties other than simply needing to train even more to achieve the next rank. Maximum Rank: The militia’s rank can never exceed the level of the most experienced PC. Organization Checks: The militia’s ability to get things done and its likelihood of withstanding setbacks are governed by its four Militia Traits: Force, Economy, Intrigue, and Magic. Force represents the Militia's military might and ability to resolve problems through strength of arms and training. Force checks are associated with the Drill Militia action (see below) that improves the Militia's overall Training Score. Economy represents the Militia's ability to maintain proper finances, broker trade arrangements, and otherwise keep the Militia running. The Economy trait is associated with the Economy check, used to determine how well the Militia's finances are handled. 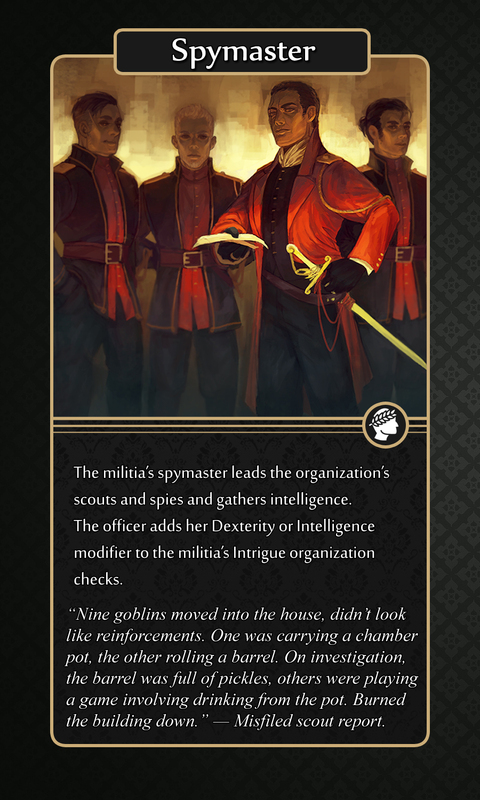 Intrigue represents the Militia's capacity to trick enemies and accomplish tasks unnoticed. Intrigue is associated with the Intrigue Check, which is used to determine how well the Militia avoids dissent in the ranks, roots out spies, and ensures internal security. Magic represents the Militia's capacity for both manipulating and understanding magic. Magic is associated with the Arcana Check, which is used to determine how well the Militia navigates supernatural threats. A militia’s base bonus for each attribute's check is determined by the militia’s rank and whether or not it is the militia’s focused check or a secondary check (see Focus below). Each check is further modified by bonuses granted by currently active officers (see the Officers section below). On Missions (see Missions below) the Militia's organization checks are further modified by the Heros (see Hero Cards below) assigned to the mission. Focus: When the PCs create a militia, the party members as a group must decide which organization check they want their organization to concentrate on. Their bonuses for that organization check will increase more quickly than for their organization’s other two checks, which are considered their secondary checks (see Table 6–1). If the PCs would like to focus the Militia on manual labor from constructing new fortifications to training and utilizing military assets, they should focus on Force. If the PCs would instead like to focus on subterfuge, hit and run tactics, and espionage they should focus on Intrigue. If the PCs would like to leverage powerful financial clout and superior resources, they should focus on Economy. Lastly, if the PCs would like to focus on commanding magical power and understanding ancient magical secrets, they should focus on Magic. Training: The militia’s training score is an abstraction of the amount of training it has received and the action it has seen. The militia starts with a training score of 0. The primary way to increase the militia’s training score is the Drill Militia action (see below). Beyond this, several factors can affect the militia’s training score in a single week, including attrition during the Upkeep phase and special events. (For more information, see the Militias in Play section below.) Increasing the militia’s training score can increase its rank (as shown in Table 6–1), but decreases cannot decrease its rank. Reputation: The militia’s reputation represents how the Militia (and the PCs) are viewed in different cities—many cities will be indifferent toward it, while others may be friendly, unfriendly, or even hostile. The effects of each reputation step are presented on the associated Reputation card attached to each Settlement card. The Reduce Danger action (see below) can improve the PCs’ reputation in a secured settlement, as can other actions in the Militia Actions section below. Notoriety: The militia’s Notoriety score is a measure of how well it and its actions are known throughout the cities and regions in which it operates. The militia’s Notoriety score can range from 0 to 100. 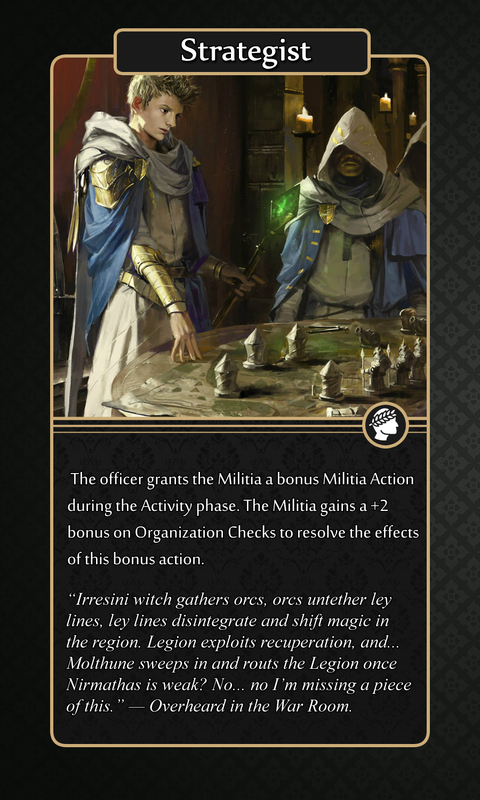 During the course of a week, the militia is likely to have experiences that can cause its Notoriety score to fluctuate (such as rolling poorly when using the Dismiss Team or Drill Militia actions). A high Notoriety score can cause varied consequences. For instance, at the end of the weekly Event phase, the GM rolls percentile dice opposed by the militia’s Notoriety score to determine whether an event occurs (see Event Cards below). The event could result in a boon, but it could also mean an opposing organization has made an aggressive move against the militia. GMs are encouraged to use circumstance modifiers to increase a militia’s Notoriety score when it or the PCs engage in tasks that might make them more visible to rivals. Militia Actions: Every week, the Militia can take actions like drilling and sabotaging foes. Its maximum number of actions per week depends on its rank (see Table 6–1). This number can be increased by bonuses from officers, unique allies, and certain events, so track it carefully. Available Actions: As the PCs’ militia progresses and it adds and upgrades teams, it can access more actions. See the Activity Phase section below for a complete list of actions and which teams are needed to take those actions. Event Chance: At the end of every week, events can occur to aid or endanger the militia. The chance that an event occurs is directly tied to the militia’s Notoriety score. During the Event phase, the GM rolls percentile dice. 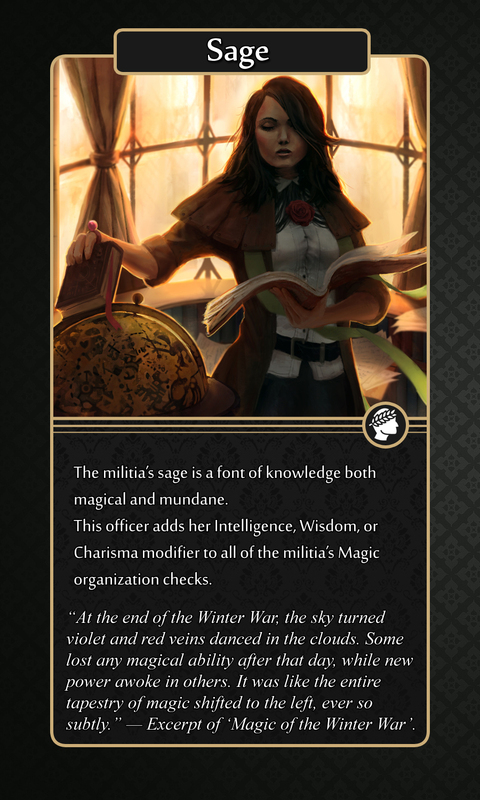 If the result is lower than the militia’s Notoriety score, an event takes place, and the PCs must pull an Event Card from the Event Deck. Events are a mix of favorable and unfavorable happenings. There is a minimum 10% chance an Event occurs each week, even if the militia’s Notoriety score is less than 10.
of an event increases by an amount equal to the militia’s rank (i.e., the GM adds the militia’s rank to its Notoriety score when determining whether an event occurs). Active Events: Many events have effects that extend throughout the week and can affect both the PCs and the Militia. Record all active events, and erase them when they’re resolved. If an event is persistent, place a mark to the left of it. The players and GM should keep track of it and follow up during the next appropriate phase (see Persistent Events on page 59). information). Each Officer role is represented by an Officer Card. If an NPC is in this role, tuck the Officer Card below their card as a reminder of their official duty. PCs with an Officer Role should keep their Officer Card with their character sheet. Teams: Teams are groups of skilled NPCs that the Militia can recruit. 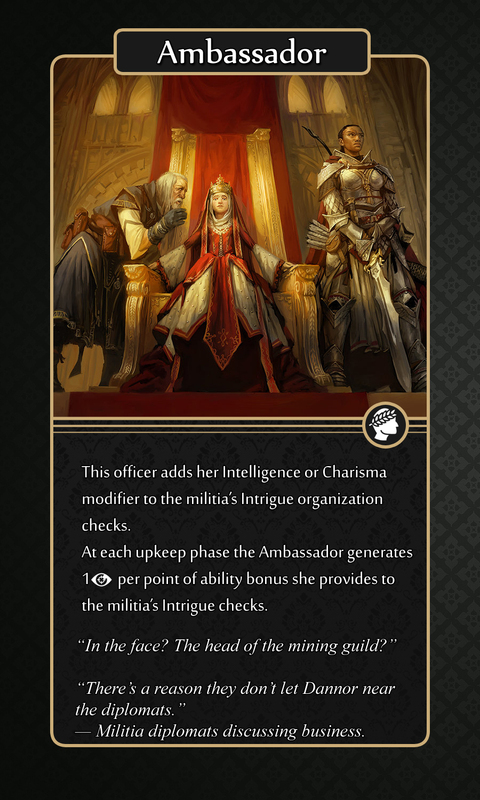 The maximum number of Teams a PC or an NPC with an Officer Card can be in charge of is equal to her Charisma modifier (minimum 1); a non-officer can manage only one team. When taking a Militia Action, a Team managed by a PC gains a bonus equal to its manager’s Charisma bonus on all of its Organization Checks. Teams managed by an NPC Hero Card gain the bonuses displayed on the card. Maximum Teams: The militia can support a limited number of teams based on its rank (see Table 6–1) . Bonus teams earned through play do not count against this maximum. Hero Cards: As the PCs adventure, they may meet important allies who can help their Militia in various ways. Once that NPC joins the Militia, the PCs gain access to their Hero Card and may assign them to various tasks. Resources: The Militia system uses four resources from the downtime system: labor, goods, influence, and magic. These resources are expended and earned by the militia and are required to perform some Actions. Each time the militia gains a rank (with the exception of rank 1), all associated PCs gain a boon (see Table 6–1). These boons are applied immediately and are permanent increases to the PCs involved. Only PCs gain these boons; NPC officers (including cohorts) do not. At rank 2, and again at ranks 7, 12, and 17, each PC gains a bonus skill rank that can be immediately applied to any skill. This represents know-how the PC has gained through association with the militia’s skilled members. This bonus skill rank can be applied to any skill, as if it were a bonus rank gained by earning a level in a favored class. It stacks with all other sources of skill ranks, but a character’s maximum rank in any skill remains unchanged; a PC can never have more ranks in any one skill than she has Hit Dice. the gift is a single potion worth 300 gp or less. The gifts given at ranks 6, 11, and 16 are all provided as tributes of gold pieces in the amounts listed; each PC gains the listed amount. At rank 8, the gift is a piece of armor or wand worth 1,200 gp or less. At rank 13, the gift is a wand or weapon worth 5,000 gp or less. Such wands are fully charged and cost the appropriate amount. At rank 18, the gift is any magic item worth 10,000 gp or less. it represents a rising confidence that the people of Nirmathas have in the Militia. Each PC gains any one feat for which she qualifies as a bonus feat. At ranks 5, 10, 15, and 20, the party earns the listed amount of experience points as a story award. Divide the XP awarded equally among all PCs in the party. 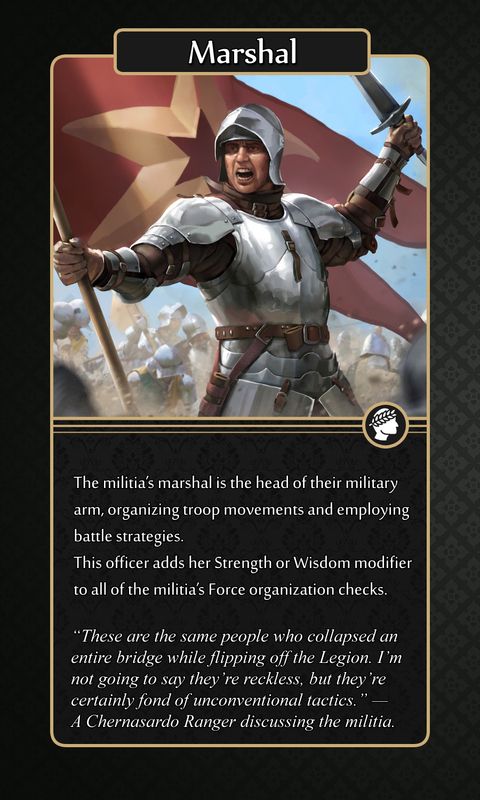 The roles of officers are generally filled by PCs, though NPCs the Militia have obtained Hero Cards for can fill these roles. There are six different officer roles available to be filled. Multiple Officers cannot fill the same roles. A wide range of common teams are available for the militia to recruit. Each grants different abilities, bonuses, and militia actions. The PCs’ militia can support a maximum number of teams determined by its rank (see Table 6–1), plus any bonus teams. The PCs can recruit teams to their militia during the Activity phase using the Recruit Team action, and teams can also be acquired over the course of the story as special rewards. Activation Cost: This is the cost in Resources that must be paid in order to assign the team to a Mission. Name: The team's name is prominently displayed at the middle. Recruit: If you can Recruit this team to the Militia, there will be an entry detailing what kind of check is required. Team Recruitment is performed in the Activity Phase (see Activity Phase below). Actions: This section lists what Militia Actions the Team can perform. See Militia Actions below for more information. Some Teams have special traits, such as gaining additional bonuses on specific types of missions. Upgrade: Some Teams can be upgraded into more advanced Teams. This section lists the cost in Resources required to upgrade the team. Upgrades are paid for during the Upkeep phase. Once a Team is upgraded it loses access to its original suite of abilities, so be tactical in choosing when and how to upgrade a Team. Once the PCs begin controlling a militia, at the end of every week of game time, they must take actions to maintain and lead the organization. This doesn’t need to take any additional in-game time; the militia’s actions can continue even without direct supervision. Each week, the Militia acts over three phases that always occur in the following order. Determine any decrease to the Militia’s training score due to attrition. Its training score can also decrease because of a high Notoriety score. Then the PCs increase the Militia’s rank if applicable, and can add to or withdraw from the Militia’s treasury. Some cards also have special rules that come into play on the Upkeep phase. The key to the militia’s growth is to constantly run drills and regimens to increase its Training score. To do this, the PCs must perform the Drill Militia action during the Activity phase. Constantly sparring will take its toll on the militia’s members, though, and some will become injured or skip training to attend to other matters, reducing the amount of training within the militia’s camp. The amount of this attrition is determined during the Upkeep Phase in three separate ways (see steps 1, 2, and 3 below). The four steps of the Upkeep phase always play out in the following order. Step 1—Training Attrition: The PCs attempt a DC 10 Force Check. If they’re successful, the militia’s Training Score decreases by 1d6. If the roll is a natural 20, the Militia instead adds 1d6 to its training score. On a failed check, the militia’s training score decreases by an amount equal to 2d4 + the militia’s rank. Step 2—Maximum-Notoriety Penalties: If the militia’s Notoriety score is 100, enemy organizations have an easier time tracking its people down. In this case, the militia’s training score is reduced by a number equal to 1d20 + the militia’s rank. The militia must also attempt a DC 15 Intrigue check or its reputation in the nearest settlement is reduced by one step (though it can never be made worse than unfriendly in this way). Step 3—Increase Rank: Apply any increases to the militia’s rank based on its current training score. If its training score currently exceeds the minimum amount needed for the next rank, and that rank would not exceed the most experienced PC’s level, increase the militia’s rank and award the appropriate Boon (see PC Boons above). The Militia can gain multiple ranks at once in this way. Step 4—Deposits and Withdrawals: Any officer can deposit Resources or withdraw equivalent gp value from the Militia’s treasury. Step 5—Move Assets: The Militia may move any number of cards (Heroes or Teams) to a Secured settlement. These assets remain unavailable for as long as it takes for them to travel to the Settlement. If the Attacked, Raid, or Week of Hell events are in play when moving an asset roll an Event check. If this check would generate an Event, randomly pick 1 card being moved. That card is captured and removed from play until the militia performs the Rescue Team action. In the Diplomacy phase, the militia affirms Diplomatic overtures toward settlements not controlled by enemy forces. This action permits the militia to make settlements allies and be allowed to operate openly from within the settlement's walls. The militia may make 1 Diplomacy action each phase, plus 1 additional diplomacy action for each Diplomats Team the militia possesses that is not presently engaged in an activity. Performing this action has an associated cost in that must be spent before the check is made. Improve Attitude (5 ): The militia reaches out to a settlement and attempts to improve its attitude toward the militia. This action takes one week to perform. The militia must succeed on an Intrigue check with a DC based on the modifiers on the table below. If the militia succeeds, the settlement’s attitude toward the militia is improved by one step. For every 5 by which the militia's check result exceeds the DC, the settlement’s attitude toward the militia increases by one additional step. A settlement's attitude cannot be shifted more than two steps up in this way, although the GM can override this rule in some situations. If the militia fails the check by 4 or less, the settlement’s attitude toward the militia is unchanged. If the militia fails by 5 or more, the settlement’s attitude toward the militia is decreased by one step. For every 5 additional spent in this fashion, the Militia gains a +2 bonus on its check for that action. A Settlement with an attitude of Friendly or better is considered a Secured settlement and the militia may move Heroes and Teams to operate out of this Settlement without needing to perform the Activate Refuge action. This check may only be made once per Settlement per turn. During the Activity phase, the militia can take a number of actions as set by its rank and modified further by a Strategist, other unique allies, or events. Actions can be taken in any order, but each requires a qualified Team unless otherwise stated. Once assigned, a Team can’t take additional actions during the same phase. The available actions are listed below. Once all militia actions during the Activity phase are resolved, the GM rolls percentile dice to see whether any special events occur that week. The percentage chance of an event occurring is equal to the militia’s Notoriety score plus any modifiers from previous Event phases or settlement reputation modifiers. During any Event Phase following an uneventful week (a week other than the militia’s first week after formation, in which no new events occur), add the militia’s Rank to the chance an event occurs. There is always at least a 10% chance but never more than a 95% chance of an event occurring. If an event occurs, the PCs must drawn an Event Card from the Event Deck. Some Events can become persistent (see Persistent Events below). Some negative events have a Mitigation listed; these allow officers to attempt Organization Checks or other actions to lessen the event’s effects. If you draw a card that cannot occur, such as the Raid event when you control no Settlements, place the card at the bottom of the Event Deck and draw again until an eligible Event is drawn. Some events have a "Twice" identifier. If this event occurs back to back on multiple weeks, it has additional effects. Events are resolved in the order in which they began; thus, the oldest persistent event is resolved first. Sometimes, an event becomes Persistent. In this case, the Event does not go away after 1 week, but continues to affect the Militia week after week. If the PCs can mitigate the event, mitigation lasts only 1 week, forcing the militia to attempt new mitigations every week. Once every 4 weeks, the PCs can end a Persistent Event by spending a number of Resources (of any kind and combination) equal to twice the Militia’s current Rank. Once this cost is paid, the event ends immediately. The below are all Actions the Militia can take during the activity phase. Unless an Action has (No Team Needed) after it, the Militia must have an active Team that can use this Activity in order to perform it in the Activity Phase. Activate Black Market: To activate a black market, the PCs attempt a DC 20 Intrigue check and spend 5 Goods to smuggle goods and bribe officials. On a successful check, the Militia can set up a black market for 1 week. This works similarly to a Broker Market action (see below), except all rolls to determine item availability increase from 75% to 90%. Furthermore, magic items sold to the black market sell for 55% of their normal price rather than 50%, and the militia can sell items that would be hard to sell on the open market, such as enemy armor or contraband. On a failed check, the militia’s Notoriety score increases by 1d6. Activate Refuge: Choose one Unsecured Settlement and attempt an Intrigue check (DC 20). If successful, the Militia creates a hidden safe house within the Settlement to operate out of. The Militia establishes a hidden route in and out of the Settlement that the PCs may use to come and go from the location unseen. The PCs may also send NPCs to the Refuge and use the location as a base of operations, assigning Hero Cards to the location as if it was Secured. However, the Militia does not gain any of the Settlement's bonuses. A Refuge stays activated for 1 week and can be renewed with another Activate Refuge action during the next Activity phase. If a Refuge becomes Inactive while it is occupied, any NPCs immediately leave the Refuge and begin returning to the Militia Headquarters (unless given other instructions). Team and Hero cards assigned to the Refuge become inactive for 1 week. Arcane Crafter: The Militia may create magic items. Choose 1 Item Creation Feat from the following (Brew Potion, Craft Wondrous Item, Scribe Scroll). You may assign a Team to craft any item using the standard rules for magic item creation. Instead of a Caster Level check to craft the item, the Milita makes a Magic check at the end of the crafting time. The team performing this action may not perform other actions until the item is finished, or construction is halted (expending any invested resources). Assassinate: This team may attempt to assassinate a known NPC. Choose a location and an NPC known to the Militia that is believed to be at that location. The assigned team departs for that location at their fastest available means. Once they arrive, the Team spends 1 week planning the assassination. At the end of that week's Upkeep phase, attempt an Intrigue check (DC = 15 + the target's CR). If successful the target is slain and the Militia's notoriety increases by 1d6 points. If the check fails, the target survives and the Militia's notoriety increases by 2d6 points. If the check fails by 5 or more the team is captured and must be rescued. If the check is failed by 10 or more all members of the team are slain. Assault: This team can attack a Settlement or other known location occupied by enemy forces. The assigned team departs for that location at their fastest available means. Once they arrive, the Team spends 1 week planning the assault. At the end of that week's Upkeep phase, attempt a Force check (DC 15 + the average CR of all enemy creatures at the location). If the check is successful all enemies within suffer 1d6 points of damage unless they are otherwise able to avoid harm (+1d6 for every 5 by which the Force check exceeds the DC) which is recovered within 24 hours (if the damage is not sufficient to kill them). The assault cripples the location's defenses and all enemies suffer a –2 penalty on all ability checks, attack rolls, saves, and skill checks for 1 week. Increase the Militia's notoriety by 2d6. If this check fails, increase the Militia's notoriety by 4d6. If the check fails by 5 the assault team is captured and must be rescued. If the check fails by 10 or more the assault team is slain. Broker Market: Select any Settlement and activate the team with this ability. With an expenditure of 10 Goods to cover the cost of supplies for travel, the militia can access a temporary marketplace. The GM treats this as a new marketplace separate from any towns in the area; the marketplace represents specific sellers that these merchants know. When activating this action, a team of merchants acts as a small town for purposes of item availability. A team of Black Marketeers instead acts as a small city. Any items purchased via the market must be paid for when the action is activated, but are not available until the beginning of the next Activity phase. Cutthroat Business: Select a Secured Settlement and attempt a DC 20 Intrigue check. If successful, this team intimidates local merchants into giving the militia steep discounts on goods for 1 week. The militia may by nonmagical items at 50% their market value and available magic items at 75% of their market value. Succeeding at this check reduces the Settlement's attitude toward the Militia by 1 step. If this check fails the Militia's Notoriety increases by 1d6 and the Settlement's attitude decreases by 2 steps. Demolish: Spent 10 Goods and select a fortification in a location held by enemy forces, such as a gate, portcullis, 10-foot section of wall, or other such structure. The assigned team travels to this location and then spends 1 week preparing for the demolition. At the end of that week's Upkeep phase, attempt an Intrigue check (DC 20). If this check is successful the team destroys the requested structure entirely. Increase the Militia's notoriety by 2d6 points. If this check fails, increase the Militia's notoriety by 1d6 points. If this check fails by 5 or more the team is slain. Change Officer Role (No Team Required): One PC or NPC can change their officer role in the Militia. Dismiss Team (No Team Required): The PCs remove a Team from the Militia, freeing up that slot to recruit a new team. Attempt a DC 10 Intrigue check; on a failed check, the militia’s Notoriety score increases by 1d6 as disenfranchised team members’ gossip spreads. Drill Militia (No Team Required): This check can be made only once per Activity phase. 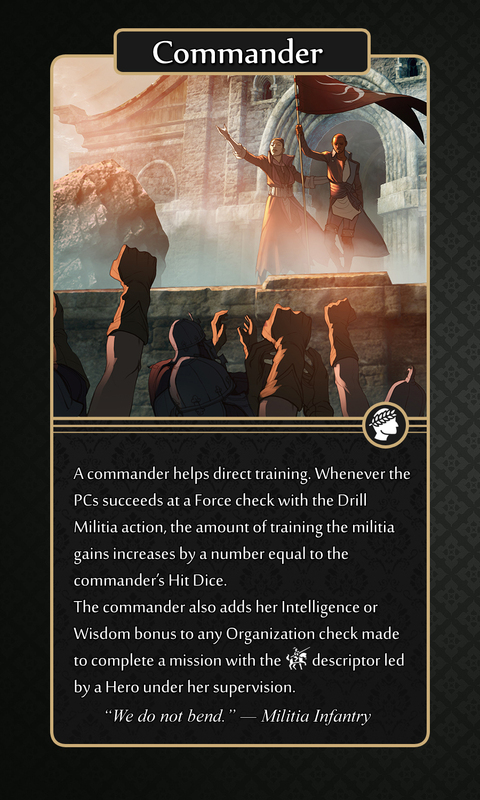 By spending an amount of Labor equal to the Militia's Rank, the PCs can attempt to increase their Militia’s training score. To do so, they must attempt a Force check. The DC of this check is equal to 10 + the Militia’s rank. On a success, increase the militia’s Training Score by 2d6 + any bonuses granted by Commandant officers. If they roll a natural 1, the check doesn’t automatically fail, but the militia’s Notoriety score increases by 1d6. The militia can’t take this action if it is at its current maximum rank. 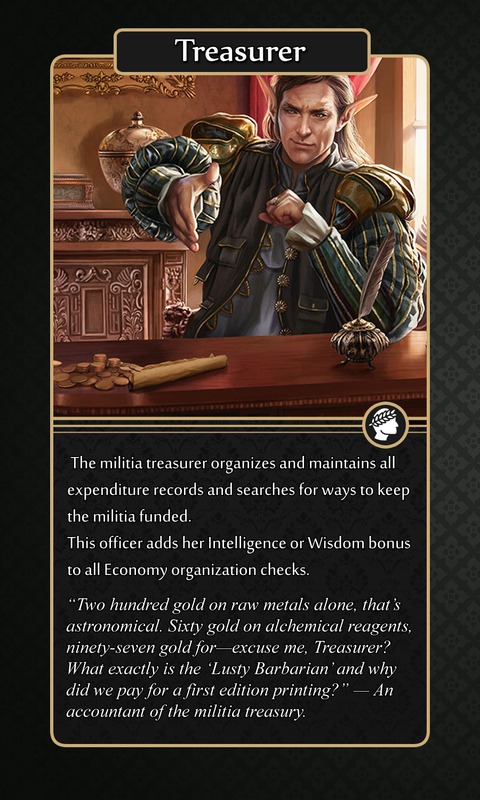 Earn Gold: The PCs attempt an Economy check and multiply the result by half the Militia's rank (minimum 1). The result is how many gold pieces the Team earned for the week. Add this result to the militia’s treasury. If they roll a natural 1, the militia still earns the gold, but its Notoriety score increases by 1d6. Gather Information: The PCs attempt a DC 15 Intrigue check. If successful, the team has gathered information. This can either be an appropriate rumor, the location of an important item or person, or any other specific information about a settlement. The GM may determine that learning a particular piece of information requires a higher DC check, or that it can’t be determined with this action at all. If they roll a natural 1, the PCs don’t automatically fail, but the militia’s Notoriety score increases by 1d6. Guarantee Event (No Team Required): By increasing its Notoriety score by 1d6 and spending an amount of Influence equal to the militia’s Rank, the PCs can guarantee that an Event occurs during the Event phase. If the militia performs this action, they draw twice from the Event deck and choose which event happens. The unused Event card is placed at the bottom of the Event deck. Handle Animal: This team may use Handle Animal to rear a wild animal using the rules presented under the Handle Animal skill. The team is unavailable for an amount of time required to rear the animal. Instead of making a Handle Animal check, the PCs make a Force check in place of the skill check. Identify: This team may ascertain the properties of a magic item the PCs own. The PCs make a Magic check as though using Spellcraft to determine the properties of a magic item. If the PCs spent 1 Magic when making this check, it is made with a +10 bonus. If successful, the item's properties are identified. Knowledge Check: The team tries to answer any question that could normally be answered with a successful Knowledge check. Rather than attempting a Knowledge check, though, the PCs attempt an Intrigue or Magic check. Add the militia’s rank to this result, and treat the total as the DC achieved in the desired Knowledge category. This action can also be used to inquire about the abilities of an NPC or monster. Lie Low (No Team Required): If the militia takes no actions other than this one during the Activity phase, its Notoriety score decreases by an amount equal to its total number of teams. Observe: Choose a location. The assigned team departs for that location at their fastest available means. Once they arrive, the Team spends 1 week stealthily observing the location. At the end of that week's Upkeep phase, attempt an Intrigue check against a DC of 20. If successful, the team reports back about any comings or goings at the location and events that transpired within the week. If this check fails, increase the Militia's notoriety by 1d6. If this check fails by 5 or more the Team is captured and must be rescued. If this check fails by 10 or more the Team is slain. Raise Character: Choose a character who has been dead no longer than one week. Provided the Militia expends the appropriate resources to pay for the material costs, that character is returned to life as though by raise dead at the end of the next week's Upkeep phase. Recruit Team (No Team Required): The militia can attempt to recruit a new Team, as long as it does not already support the maximum number of teams allowed (discounting bonus teams). The DC and specific organization check required to recruit the team depend on the type of team being recruited and is displayed on the Team's card. Some locations, once secured, allow for the recruitment of teams not normally available. To successfully recruit a Team, you must also immediately pay that team's activation cost. Rolling a natural 1 on the organization check does not mean automatic failure, but the militia’s Notoriety score increases by 1d6. Reduce Danger: Choose a Settlement. With a successful DC 15 Force check, the team provides additional material support and protection for the townspeople, temporarily improving the settlement's Attitude toward the militia by one step for the week. On a failed check, the militia’s Notoriety score increases by 1d4. Request Aid: Pick a Settlement and attempt an Intrigue check against a DC of 20. If this check is successful, the Militia increases its Notoriety by 1d4 points and may recruit one Team of its choice from the settlement without paying its activation cost. Rescue Character: This team breaks into a prison or another secure site to rescue a captured character (either a PC or an NPC). To do so, the PCs attempt an Intrigue check (DC = 10 + the captured character’s level, or DC 20 for a captured Team). A successfully recovered character can be brought to any location from which the militia operates, including a refuge. A successful rescue increases the militia’s Notoriety score by an amount equal to the level of the rescued character. A failed rescue increases the militia’s Notoriety score by half this amount, but the character is not rescued. At the GM’s discretion, certain NPCs can’t be rescued by the militia and must instead be rescued by the PCs. The Rescue Character action can be used to rescue only one character or Team per action. Restore Character: This action can be used to perform one of the following for the entire party: heal all ability score damage, heal all hit point damage, or receive the benefits of one 3rd-level or lower restorative spell (such as dispel magic, remove blindness/deafness, or remove paralysis). It can instead provide the effects of a break enchantment, restoration, or stone to flesh spell to one individual. The body or remains of the character to be restored must be brought to the militia’s current location, a secured Settlement, or an activated Refuge (possibly requiring a separate Rescue Character action). These greater spell effects are provided via scroll use and require an expenditure of gold equal to the cost of the scroll in question (1,125 gp for break enchantment, 1,700 gp for restoration, and 1,650 gp for stone to flesh). Ritual: This team is capable of performing occult rituals that the Militia has discovered. Choose one ritual the Militia knows and attempt a Magic check against the ritual's DC. If the ritual's casting time is longer than 24 hours, its benefits are applied as soon as the casting time is completed, and the Team performing the ritual is unavailable during this time. If the Magic check is successful, the team successfully casts the ritual. If the check fails, the team is disabled for 1 week per spell level of the ritual. If the check fails by 5 or more the Team is slain by magical backlash. Sabotage: If an Event occurs and a Team with the Sabotage Action aren’t currently engaged in an activity or mission, missing, or disabled, the PCs can activate the saboteurs and the team can try to negate the event with a successful Intrigue check. The DC to negate the effect is 15 + the militia’s rank. Taking this action increases the militia’s Notoriety score by 1d6 regardless of whether it’s successful. Scout: This action allows a Team to explore an area. Select a location; a team with the Scout action thoroughly explores a 50-mile radius around that location, then attempts either a Force or Intrigue check against the location's Discovery DC. If successful, the Team earns Discovery Points for that area as normal. Secure Cache: The team can arrange for a cache of equipment to be hidden near a place of the PCs’ choosing, or retrieve a cache from within a secured location. Securing a cache requires purchasing the items (or providing the team with items already owned), and succeeding at an Intrigue check to stash them. Caches come in three categories: minor, intermediate, and major. A minor cache can weigh at most 5 pounds, and can be worth no more than 900 gp in all. Securing a minor cache requires a successful DC 15 Intrigue check. An intermediate cache can weigh at most 10 pounds, and can be worth no more than 2,500 gp in all. Securing an intermediate cache requires a successful DC 20 Intrigue check. A major cache can weigh at most 20 pounds, but can be worth any amount. Using a bag of holding, portable hole, or similar extradimensional storage item expands the weight limit of major caches. Securing a major cache requires a successful DC 30 Intrigue check. The team can secure a cache in any place (even a location where the militia is not allowed, such as a hostile fortress). When a cache is placed inside such a location, the DC to hide it increases by 5. Failing the check means that the militia’s agents couldn’t find a way to get the cache in place, and they can return it to the PCs at the beginning of the next Activity phase. Retrieving a cache can include trying to get back an unused cache or receiving a cache from inside sources. Retrieving an unused cache requires the same checks as for securing caches. Siege: This ability functions as the Assault Action, except that it may be carried out over consecutive weeks and penalties applied by successful Assault checks are cumulative for each week the siege goes on for. This team may perform the Siege action for a number of consecutive weeks equal to the Militia's Rank. Multiple teams with this Action can perform it in concert, and each team after the first adds a +2 bonus to the Force check made to see if the action is successful. Special Order: This Team can place a special order from contacts in other cities for a specific item. The cost for the item must be paid up front (although the actual price includes a 5% discount due to the Team’s expertise at haggling), and it is delivered to the militia in 2d6 days. The GM has final say on whether an item is available for special order. Alternately, the fixers’ contacts can locate someone to put an enchantment on one of the militia’s current magic items. Doing so takes the same amount of time plus 1 day per 1,000 gp that the enchantment costs. Only one item or enchantment can be purchased in this way per action. Strike Team: The PCs must specify the location where the team is sent when the militia takes this action during the Activity phase. Once during the following week—at the PCs’ determination—while the party is at that location, the PCs are aided for 24 hours by a Troop representing the team with a CR equal to the Militia's Rank. If the troop is killed the Team is slain. Supplement Officer: Assign this Team to an officer. That Officer may now manage 1 additional team and gains a +2 bonus to all Organization checks. This team can remain in this state indefinitely, but cannot take any other Action while performing the Supplement Officer Action. Support Fire: Choose an outdoor location the PCs intend to explore within the week. This team immediately departs to the location and on arrival waits for the PCs. Whenever the PCs are in combat, this team remains at a long range providing support fire. Each round of combat, the Team targets one 20-foot square. All creatures within that square take 1d8 points of piercing damage, plus an additional 1d8 points of piercing damage per 3 Militia Ranks. A successful Reflex save (DC 10 + the Militia's Rank) halves this damage. Surveil: With a successful DC 20 Intrigue check, this Team provides reconnaissance on a location. If the PCs visit this location within 1 week of the Surveil action taking place, they gain a +1 insight bonus on all attack rolls and skill checks made while in that location. This bonus increases by +1 for every 4 Ranks the militia has. Theft: This team may attempt to steal a specific item or type of item. Choose a location and an item or type of item known to the Militia that is believed to be at that location. The assigned team departs for that location at their fastest available means. Once they arrive, the Team spends 1 week planning the heist. At the end of that week's Upkeep phase, attempt an Intrigue check (DC = 15 + the average CR of all creatures at the location of the heist). If successful the object is stolen and is delivered to the Militia's headquarters or a Secured Settlement and the Militia's notoriety increases by 1d6 points. If the check fails, the Team fails to steal the object and the Militia's notoriety increases by 2d6 points. If the check fails by 5 or more the team is captured and must be rescued. If the check is failed by 10 or more all members of the team are slain. A mission is a special assignment that is revealed to the Militia over the course of play that an NPC represented by a Hero Card can be sent on. Missions provide rewards to the Militia if they are successfully completed. Each Mission has four different DCs, aligned with the four Organization Checks (Force, Magic, Economy, and Intrigue). These DCs represent how challenging it is to resolve the mission using that check's approach. Mission DCs vary between each type of check and these DCs are typically hidden from the PCs. Each Mission also has a special Type icon, located in the middle of the Mission Card next to the Mission Name. Some Heroes and Teams interact uniquely with specific Mission Identifiers, as described on their cards. 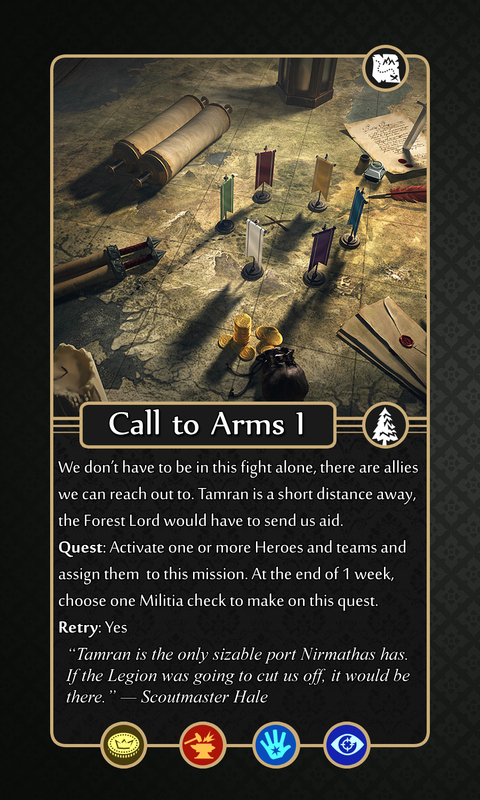 The Militia may assign a number of Hero Cards to a single Mission equal to its total number of maximum Actions in a round, but the act of assigning a Hero Card to a Mission does not take an Action. Additionally, each Hero Card may have 1 (or more with special abilities) Team they manage to accompany them on this Mission. Once all Hero Cards are assigned, the Militia must determine how to approach the Mission by choosing one of four Organization Checks. 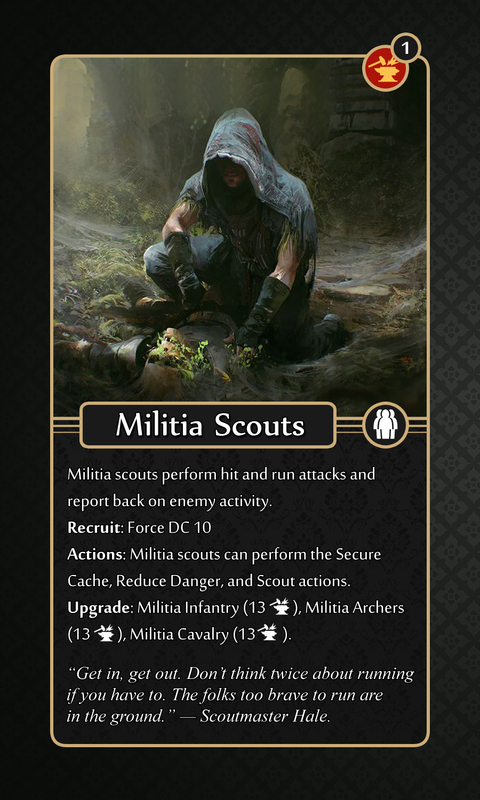 The Militia gains bonuses and penalties on the chosen check based on the modifiers provided by each Hero Card (shown on the bottom of their card). The PCs then make the appropriate Mission Check and the GM flips the Mission Card over to reveal the DCs. If the DC is met, the mission is successful and the PCs gain its associated reward (some Missions award scaling rewards for checks that exceed the Mission DC). If the PCs fail the Organization Check, the Mission is a failure and all Hero Cards and Teams assigned are disabled for 1 week. If the PCs fail the Organization Check by 5 or more, one of the Teams assigned to the Mission are captured or lost (if there are no Teams on the Mission, a Hero Card suffers this effect instead). If the PCs fail the Organization Check by 10 or more, all Hero Cards and Teams assigned to the mission are captured. On some missions, failure by 5 or 10 results in death rather than captivity. Additional rules for the Mission System will be revealed as Ironfang Invasion progresses.